Many people are nervous about measuring their room space properly, but it’s not difficult at all if you follow a few simple steps. Plus, it’s important to get the measurements right from the very beginning. Doing so will pay off throughout the whole project! Walls and floors- Measure from the floor to the ceiling, the distance between walls, and from the corners to the doors. Make a note of things that project into the room like pipes, ventilation units and radiators. Also note any special angles or other architectural features. 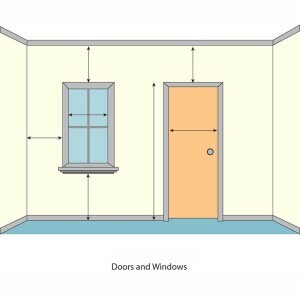 Doors and windows- Measure the size of all doors and windows, along with the distance of each from the floor, ceiling and edges. Make a note of the space that doors and windows will need to swing open. If you’re planning to install a cabinet under a window, a rule of thumb is that the minimum distance between the window frame and the floor is 35″ to 40″. Other items- Don’t forget the location of small items like electrical sockets, switches, plus water and gas connections! Some of these may be moved to suit your new layout, but if you can avoid doing so while still achieving the layout and functionality you desire, it’s best to plan for that now. Mark down where you would like any new outlets, switches and connections to be placed. Don’t be afraid to ask the specialists at your local Home Depot store for assistance, or to check over your work. Most will be more than happy to assist you.